Historian George Milton Fort wrote: “Richmond, one of ‘Commodore’ Cornelius Vanderbilt’s ablest lieutenants, had a large part in putting together the various short railroad lines of western New York to make the New York Central system — serving as president of that organization. This experience led him to apply a similar technique to Democratic politics. Richmond [in 1860] took the lead for Douglas; Seymour followed him, and respected his organizing skill and power drive. To [Samuel] Tilden he turned for the development of ideas and the formation of policies growing out of them.”3 They devised strategy for the Democratic National Convention in April. It is not altogether unfair to lay the blame for the breaking up of the Charleston convention on Dean Richmond and the New York delegation. In all close votes an apparent contradiction of practice became evident, for the states could impose the unit rule or not as they pleased. When important matters like the two-thirds rule and the platform were settled by a majority vote, it was obvious that partial use of the unit rule might easily enable a smaller part of the convention to dominate the larger. The state convention had directed that the delegation which was seated should vote as a unit; but for that fact the minority in that delegation of ‘Softs’ could have saved the platform which the South demanded. Only Clancy, Savage and Belmont of the city followed the lead of Douglas men from upstate. Thus twenty votes controlled the other fifteen. Had New York divided her vote in proportion to the opinions of her representatives and let the South have its platform, the convention might never have dissolved. Richmond’s political leadership was sometimes undermined by his business interests — which in turn undermined the 1864 re-election campaign of Governor Horatio Seymour. According to Seymour biographer Stewart Mitchell, Richmond was an opponent, not a lieutenant of [Cornelius] Vanderbilt. “On April 21, 1863, Commodore Vanderbilt persuaded the common council of the city to grant him the right to extend the Harlem Railroad, which he controlled, from Fourth Avenue down Manhattan Island to the Battery by a traction line on Broadway. His angry rivals at Tammany Hall determined to get a franchise from the superior power of the state, according to which they could lay their own tracks on Broadway or compel Vanderbilt to buy them out. Dean Richmond and Peter Cagger, two of the most powerful men in the councils of the Democratic party of the state, had long been bitter rivals of Vanderbilt in the business of handling the freight which went up and down the Hudson Valley. Naturally enough, Richmond and Cagger were pleased to make trouble for Vanderbilt by helping [Tweed associate Peter B.] Sweeney to push his franchise through the legislature.” Added Mitchell: “Thus Governor Seymour was confronted with another difficult and delicate problem. Richmond was state chairman of his party, and Vanderbilt was the rival of his friends. The city had granted one franchise, and the state had granted another.”13 Seymour ruled in Vanderbilt’s favor — alienating Tammany Hall. But in 1864, Richmond’s political touch was not as deft. 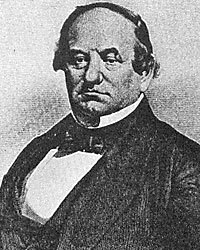 Historian Sidney David Brummer wrote that Richmond bore responsibility for the amalgamation of pro-war presidential candidate George B. McClellan with anti-war candidate George Pendleton, an Ohio Congressman, on the Democratic ticket. ‘Since it does not appear that Dean Richmond or his representatives made any fight outside of the committee against the platform or against the nomination of Pendleton, it can scarcely be claimed that the New York leader exhibited on this occasion any great political sagacity.”14 A few weeks later, Richmond’s plans to field a new candidate to succeed Governor Horatio Seymour were derailed by a runaway convention that drafted Seymour to run again — and lose. After the Democratic ticket’s defeat in 1864, Richmond had one last poignant connection with President Lincoln. When the murdered President’s funeral train traveled from Albany to Buffalo along the New York Central railroad lines, it was pulled by a locomotive named the “Dean Richmond.” Richmond himself pushed out Erastus Corning as president of the New York Central early in 1865. Richmond held that post only until August 1866 when he died at the home of future New York State Governor Samuel J. Tilden. Once again, the New York Central’s locomotives were draped in crepe. Chauncey M. Depew, My Memories of Eighty Years, p. 22-23. Sidney David Brummer, Political History of New York State During the Period of the Civil War, p. 25 (Albany Evening Journal, June 20, 1860). George Fort Milton, Abraham Lincoln and the Fifth Column, p. 115. Stewart Mitchell, Horatio Seymour of New York, p. 209. Stewart Mitchell, Horatio Seymour of New York, p. 212. Sidney David Brummer, Political History of New York State During the Period of the Civil War, p. 57-58. Sidney David Brummer, Political History of New York State During the Period of the Civil War, p. 25. Marjory B. Hinman, Daniel S. Dickinson: Defender of the Constitution, p. 162. Jerome Mushkat, Tammany: The Evolution of a Political Machine, 1789-1865, p. 330. Stewart Mitchell, Horatio Seymour of New York, p. 245. Stewart Mitchell, Horatio Seymour of New York, p. 247-248. Stewart Mitchell, Horatio Seymour of New York, p. 287. Sidney David Brummer, Political History of New York State During the Period of the Civil War, p. 406.